Prakriti is an important concept of Ayurveda that explains individuality and has role in prevention, diagnosis and treatment of diseases. It expresses unique trait of an individual that is defined by specific and permanent composition of Dosha right from birth. Prakriti makes every person unique therefore no person can be exactly like other person. It means physical, physiological and mental characteristics differ from person to person depending on his Prakriti. It defines how person reacts to its surrounding environment, external factors including medicine. All these points are of extreme importance while making the diagnosis and treating the patients. Because treatment differs according to Prakriti of an individual. Ayurved believes in Medicine for an individual person and not for an individual organ or system. " Ayurveda offers specifically tailored recommendations for every individual, ranging from general lifestyle changes to the treatment of disease. For this reason, Ayurveda can truly be called a system of individualized health care, something remarkably different from the Western medicines 'one-pill for all' approach. The book "AYURVEDIC PRAKRITI"(Your Dosha-Constitution & It's Significance to You) is a complete and comprehensive guide on the subject. Everywhere you will find charts and quizes to determine your Dosha or Prakriti. But it is very important to know -' What is it'e Significance to me?'. This Ebook caters this exact need and elaborates the importance of knowing ones Prakriti and makes Diet and Life style recommendations accordingly. 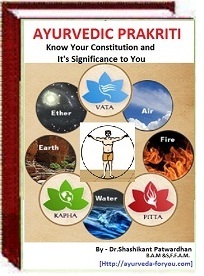 A chapter describes a classification of Prakriti and characteristics of various types of Dosha Prakriti. Dr. Shashikant Patwardhan is an expert Ayurvedic consultant and has an experience of more than 30 years. He has successfully compiled this complete and comprehensive ebook on "AYURVEDIC PRAKRITI"(Your Dosha-Constitution & It's Significance to You) .